UDM Downloads > CT Developer Studio! Implement a professional voice response system into your business quickly and efficiently. CT Developer Studio helps you develop and host automated call handling systems which can be tailored to individual needs. Develop complex IVR software or implement a simple inbound call center, set up automatic dialing or create a fully automatic call management system in Windows. Setting up an IVR system becomes fast and straightforward using CT Developer Studio. Get started in minutes using one of the many supplied demonstration templates. Quickly modify the details to suit your own requirements thanks to CT Developer Studio graphical interface. Drag and drop components and draw connections with a mouse onto a flow chart to specify the route for your calls. This visual development approach closely mimics the "What You See Is What You Get" approach of modern text processors, allowing you to model your resulting voice application in a straightforward way. SQL database support ensures fast and error-free operation under heavy loads even in the busiest environments. CT Developer Studio is designed to handle hundreds of phone lines and concurrent phone calls on a regular Windows PC. The intuitive graphical IVR designer can create your IVR system in a matter of minutes, and the rich functionality and the ease with which CT Developer Studio can be customized provides you with the means of creating the call handling system you want. 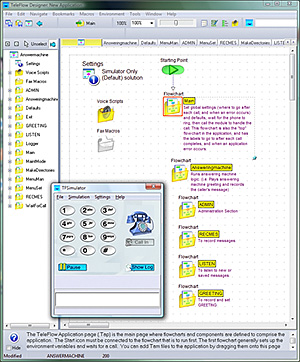 CT Developer Studio intuitive, icon-based interface removes the complexity of developing advanced call centers, IVR scripts and call routing applications by seamlessly integrating telephony and computers. Complex functions are built into simple graphical icons. CT Developer Studio is an ideal tool for developing, hosting and managing advanced voice applications. CT Developer Studio supports a wide variety of telephony cards such as Intel/Dialogic, NMS, and Ai-Logix.